The braking system is made of a braking pump (Brembo) and a braking caliper, into this caliper is placed an elastic element with a programmed deformation that will modulate the braking action. 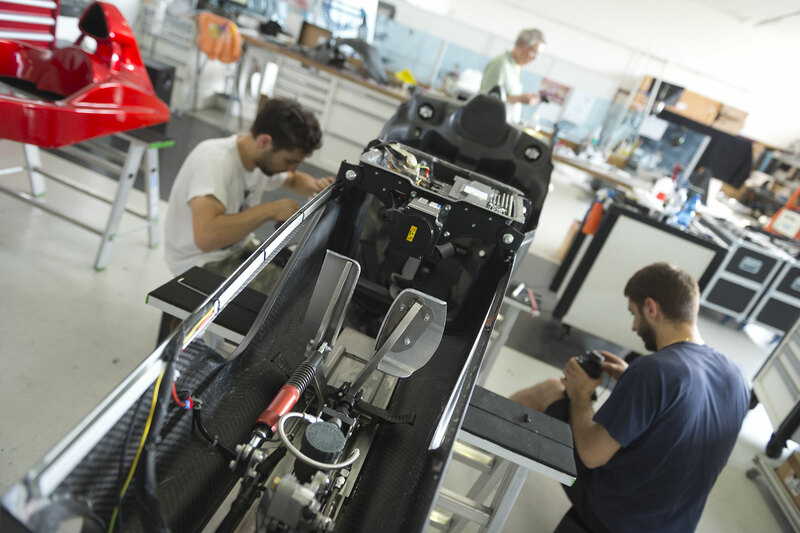 The effort of the pedal and the extension of the modulation loyally reply the real behavior of an actual Formula 1 vehicle. The pressure of the circuits is the input for the control of the braking of the software ad it is acquired through a professional sensor of pressure that is used on the vehicles of Formula 1. 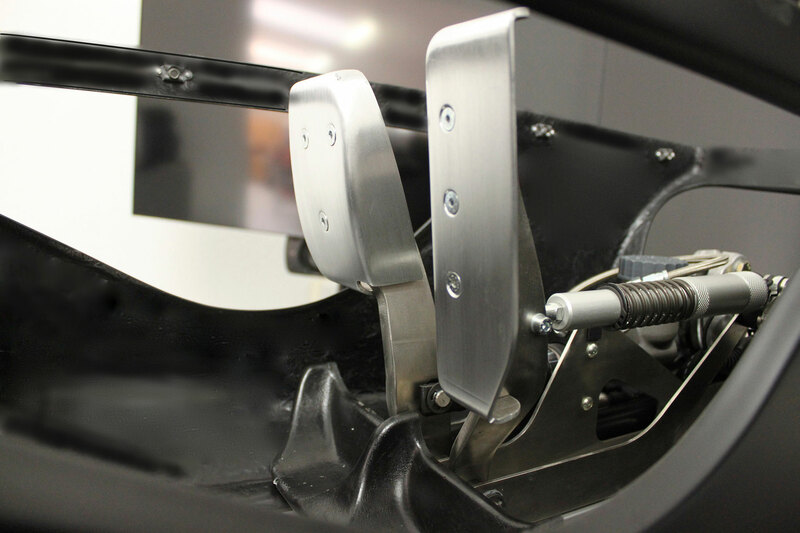 The structure of the braking pedal is realized with stainless steel. The command of the accelerator include the integrated device of the linear position sensor with external coaxial spring . The potentiometer is a sensor for a professional high quality use, that is now in use on some Formula 1 vehicles. The accelerator pedal and general drive by wire are fully realized in aluminum. Currently the set could have two different configurations: with or without the rapid system of driving position regulation. 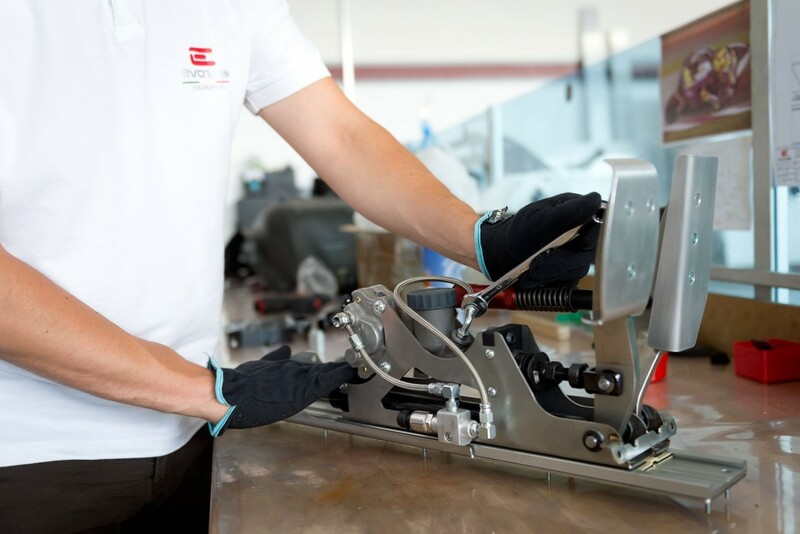 Particularly robust, strong and reliable the pedals Evotek 027 is often used not only on the simulator but also as complement of the equipment in the gym and it’s used by drivers of Formula 1 during a “physical and psychophysical” training. Practically “indestructible” Evotek pedals is mainly realized using high-quality steel for an intense and extended use. Evotek pedals of Sym Club Edition have an improved feeling, reaching a more stable and reliable behavior during the time. The pedal module assimilate the device for the registration of the position of the pedals that allows a quick and precise customization of the ergonomic driving posture. The pedals set is compatible with every software. Note: Evotek device for the registration of pedals position has been recently adopted also the vehicle of a prestigious Italian car company.